Can anyone share their experiences with rosins? I plan on buying a new block of rosin for my violin. It would be great if people here could share their experiences and feedback with different brands of rosin. The latest I've used is of a Bachendorff brand. I've been using it for almost two years now and its starting to crumble. I've read that rosin blocks should be replaced every 6 to 12 months but I didn't feel changing it any time sooner since it was still doing its job. I can say that it's a step up above the generic rosin blocks that usually come in violin setups but I'm not so sure how high it places compared to other brands. I currently have my eyes set on the Jade, Pirastro Goldflex, Hill Dark, and the Andrea Violin Solo rosin brands. I'm looking for a smooth but gripping and responsive rosin so I guess I should be looking more at the lighter ones (correct me if I'm wrong). I know the brand/type of rosin to be used is really a personal choice and it would be best to experiment with each but if anyone can give me some direction to which brand I should try first, that would be great! PS: Just in case knowing the strings I use will help, I use dominants for my G, D, and A strings while a Jargar Forte for my E string. Well I'm a total beginner so i dunno how much my opinion really counts as most rosins sound pretty similar to me. I have been trying a few lately just to try them out and see what they are like. I have used both light and dark hill rosins, and I really like them both. (especially compared to the cheap dark rosin that came with my violin) I used the light in the summer and the dark i use in the winter. They both sound great to me and for my level the responsiveness is awesome. I dunno how advanced you are or what kind of music you play but for a beginner like me i love them. I also just tried the Jade rosin since we are kinda that in between weather thats not quite hot/humid enough during the day for light or cold/dry enough at night for dark. It produced a wonderful sound that was inbetween the grippyness of the light and dark hill rosin BUT i found it wore off extreamly quickly, though to give it credit i just tried it out today and it's a new block so could be i just got less on the bow then i thought, but from some of the stuff i've read i'm not the only one who thinks it works off rather quickly. good luck on your rosin adventures. hope you find one you like There are tons to try. Oh n i have to mention it since im currently living here. Apparently there is a rosin called Melos (im pretty sure thats how its spelled) They apparently make their rosin like Baker's rosin, from live trees on mainland greece, but they ship all over the world and are a huge company and its 100% pure rosin with no additives. I dunno how good it is cause i've never tried it, but having heard such great things about Bakers, thought i might mention it. I have been using Jade for a long time. It does not seem to produce as much dust as the cheaper rosins. For a while I used "Super Sensitive" light rosin. It was okay and basically did what rosin is supposed to do. Then I tried Hidersine light rosin, It seemed too dry and scratchy and didn't seem to give the bow a good "grip" on the strings. These days I use dark rosin exclusively. I prefer it. I use it year round. Seems to give me a nice smooth but solid bow to string "grip" and a nice rich tone. I use dark rosin year round. All rosins produce dust. Especially right after you rosin up the bow. I generally clean it off my fingerboard and body of the violin when I am done playing. Although some players just leave the dust on there. Guess it' a matter of preference. All musicians are different. I like to keep my violin clean and as free of rosin dust and smudges as possible. I use Magic Rosin's Ultra and 3G, and Hill's dark. They're all considered "grippy" rosins, from what I understand. The Ultra is what I use most often, and I'll switch to the 3G or the Hill Dark if the weather is very humid or dry, or if I just want a smoother or growlier sound that day. None of them leave a lot of dust for me. The 3G is a little dustier, and the Hill dark leaves a little more rosin on the strings, but not enough in either case for me to avoid using them because of it. I prefer to keep the dust wiped off my violins. I've also used RDM dark and whatever sort of cheap rosin comes "free" with inexpensive violins. The RDM was pretty good, but the stuff that came with my old Mendini was pretty awful. I gave both of those away when I gave the Mendini to a friend. Good info. I will be looking for some rosin in the future. I have tried three different kinds. I am ok with my super sensitive dark and ..dang..the name escapes me for the round cake in the little plastic black case that I bought from FM. I seem to be okay in the rosin area. I don't rosin as much as I used to..sometimes I forget..then I come to a play where some scratching happens or noise that I don't like.. and I realize A. there is build up on my strings.. OR B. I have not enough rosin on my bow. Then thing sound better. Again, I am using Jade. I do not get dust on my violin or fingerboard. I only get rosin on the strings, and I wipe that off before I play. I've been using 'Pirastro Piranito' ever since I started to play. It does the job without being dusty. It doesn't get all over the violin. I've tried a couple of others and have found nothing better. I wanted to kinda change my last review just a bit. Today i got two more violin bows and i was able to actually do a comparison side by side of the three types of rosin. As far as sound goes the Hill light/dark and Jade all sounded the same. Surprisingly the only marked difference i noticed was that both the Hill dark and the Jade were more grippy on the strings the the Hill light. (darks do tend to be more grippy) And between the Dark and Jade, the dark was more grippy then the Jade. The hill light didn't have as good a grip so the sound projection was slightly lower but over all the three were very similar. As far as dust goes, they all seemed to be about the same. I only had a bit of dust on the strings and didn't see anything obvious on the body of my violin. The Hill dark was easiest to rosin the new hair of the bow, and the Hill light was the hardest (which makes sense being a harder rosin). the jade was already on the bow hair but being more on the darker side i don't see it being that hard to apply either. The responsiveness of all three was great, but i feel like the Dark and Jade definally had a better responsiveness due to having more grip on the strings. The Light took a bit more pressure to get the responses out of it. The hill dark I will say for right now was my favorite as far as grippyness and the sound projection. The E on my violin is a bit shrill and this helped tone it down just a tiny more then the other two. I live in greece, and it currently fluctuates between cold in the mornings and warm/hot in the afternoons to cool in the evenings and we sit at about 60% humidity give or take. My favorites might change come summer, but probably not. climate might have a bit to do with ones that sound a bit better or worse but over all i don't think it makes a huge difference. hope this helps a bit. good luck! Halloween is tomorrow so I might as well resurrect a zombie thread. Being a newbie I may not be as discriminating as some about rosin but I am starting to notice a difference in the action of mine as the humidity is now changing with the seasons. After going through Pirastro Goldflex and Magic Rosin I settled on Andrea Solo and I have been pretty happy with it. So from what I understand I may need to switch to something softer with a little more grip. Any suggestions? The humidity here runs about 70% in the summer and falls to around 30 to 40% in the winter. Would the Fiddlerman rosin be a good choice or is it closer to being just like the Andrea Solo. I've read that Jade might be a good choice. Any opinions on that? I liked the Goldflex almost as much as the Andrea Solo so I'm considering their Eudoxa or Obligato also. How about those? I'd really like to try the Fiddlerman rosin anyway because I've been happy with all of their items so far so I may give it a run when the humidity raises again. I have the pirastro goldflex and some thomastik medium dark rosin. So yea I find the medium dark rosin to have better grip, either due to the darkness or maybe it's more because of the 'gold dust' in the pirastro easing up the friction a bit.. The pirastro sounds better on the lower strings, while it sometimes struggles to properly grip on the E while the Thomastik plays all strings fine, but the lower ones sound a bit more harsh. Well since this is a resurrected "zombie" thread I thought I'd re-weigh in about rosins. I typically don't see a huge difference, other then personal between summer and winter timeframes, now that I've had a few years to play. However I've always favored dark rosins so that may be why and i haven't lived in super hot/humid places with my violin....however I will say my current favorite in the rosin world are 1. Bakers rosin, 2. Holstein rosin and 3. Andrea solo rosin. 1. Bakers seems to do really well regardless of season however it's extremely hard to get so thats all I'll say about that. 2. Holstein Rosin: It's a fantastic price for the rosin you get. It's my go to rosin for my traveling violin since it plays fantastically well both indoors and out and if I accidentally leave it somewhere it's not the end of the world where i have to wait years (glaring at you bakers) or spend a bunch of money to replace it (death stare to you andrea). It applies very easily (no scratching surfaces needed) and wears really well on my bow hair. I find myself rosining every few days or so, unless I just go crazy practicing though my typical practice session is about an hour a day so take that how you will. It has just the right grippiness to the stings and very low dust. 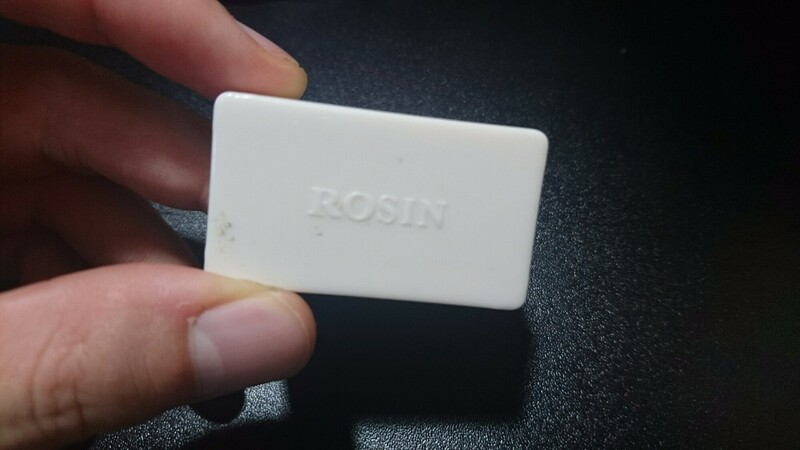 I find it's (and I believe it's marketed as) a medium rosin and if your violin seems to be a bit temperamental with your rosins, or your environment justifies a switch, go with Holstein rosin. Great price, great sound/response on the strings and last of all who doesn't want to support fiddlerman?! Also since it's a medium rosin it should negate most of "switching rosins" for the seasons. 3. Andrea rosin: I really liked this rosin when I got it. It was my upgrade from Hill/jade rosin I mentioned above and it greatly outperformed both of those more beginner/intermediate rosins. However I have noticed that after about 6 months to a year it gets REALLY gets dusty and I have to apply it a lot more often....This is a rosin that really seems to go with the replace every 6 months to a year mantra. Being a more expensive rosin, it doesn't seem to age as well, and if you break or loose it it's costly to replace I'd choose it as a second go to rosin instead of a first. However when the rosin was new it did bring a bit more ring out of my violin but not enough to justify re-purchasing a new cake now that mine pretty much died after roughly 2 years of use. edit: Andrea is also marketed as a dark rosin so going "darker/softer" may not be what you're actually looking for since that's essentially what you have. Your rosin may just be drying out/aging and loosing some of it's grip. I know that happened to my Andrea and is why i now prefer bakers and Holstein rosin. Happy rosin hunting! it's always an interesting journey for everyone i think. We all have preferences on which ones we like more or less due to our playing styles and our bows/violins! I have been unhappy with my light rosin. It can get warm and humid in the summer so I got light rosin. Super Sensitive. I have a small block of Super Sensitive Dark, a mini block which I am using now! I am planning to use FM's Holstein Red rosin as my go to rosin and Dark rosin ( possibly Hill's) for our extremely Dry winters. Definitely prefer a grippier rosin than light EVEN in our humid summers. By the way, not all days are humid in our summers, we can get down to 50-60% on good days. The light is too hard! More work than it is worth. Again, it is different for everyone, based on climate and personal preference. I figure Holstein will be a nice compromise for Spring, summer and fall. Winter hear is brutally dry so Dark for sure!! That's a very thoughtful review and pretty much what I was asking for so thank you for that. From what I understand some rosins are subject to a change in performance after a year or so, and some not. So how does someone like myself tell if I'm getting "fresh" rosin? I have no problem with throwing away the rest of an unused cake every year or so and replacing it since rosin is relatively cheap. At least most brands are and that is what I'm limiting myself to at this point. There are too many GOOD choices at around $20 or less for me to consider paying more. Granted, my Andrea Solo was only a half cake for $21.99 but it's still more than I will use in a year. I've read elsewhere that using a medium rosin just requires a gradual change in technique as the seasons change. There is some wisdom in that. The FM will probably be all I will need for a long time. I think I'll buy a cake and if I like it I'll see how it fares over the seasons. In a year I'll buy another to see if I can tell any difference. Like I said before, I've had good luck with everything else from FM. Well in all honesty it's a gamble. Buying from small venues such as Fiddlerman and Bakers gets you the best sources/freshest rosins usually. They typically stock or make limited quantities and are likely to have high turn over. For larger brands such as andrea, Piastro, even Hill it can be incredibly difficult what your getting as far as age because they never print a manufactured on date anywhere on the labels and they distribute worldwide. It could have come straight from where ever they make their rosin and it could have sat in the warehouse for 2 or more years....or even on the shelf for that long from some places. The advice given to me was pick a place that has high traffic/turnover of rosins your looking to purchase and buy from there. You're more likely to get a fresh, or fresher product then other places. but it's a huge gamble. Thats why rosins such as Bakers and Holstein's rosin (I'm assuming that Pierre works directly with the maker as he does with a lot of his other goods) performance is greater right out of the box because it's fresh! This also means it should last longer before becoming noticeably worse/needing to be replaced. I haven't had my Holstein rosin long enough to know but it seems to be holding up really well so far. As far as which rosin to pick....good luck! There are tons to choose from but I would recommend most of the brands sold on fiddlershop as those seem to be the most favored, with usually great reviews all over the internet...at least they were a while ago before I settled on my favorites. If you start getting into the weird ones on amazon it could go great and it could go disastrously wrong too using up your budget for rosin very very quickly. It's never bad for sticking with "tried and true" 😀 Good luck and I hope you find the "perfect" fit for you and your violins! So I have a sneaky feeling that while sure... there may be some extent of aging going on in rosin (probably also depending on the conditions it was kept in - mainly sunlight, I assume), but most of this might originate from people not realizing their bow needs to be re-haired and blame the rosin instead. My bow is a FM CF and it is less than 2 months old. Even though I practice 2 hours a day I don't think it is close to being worn out.